Do you want to knit a cat a scarf? 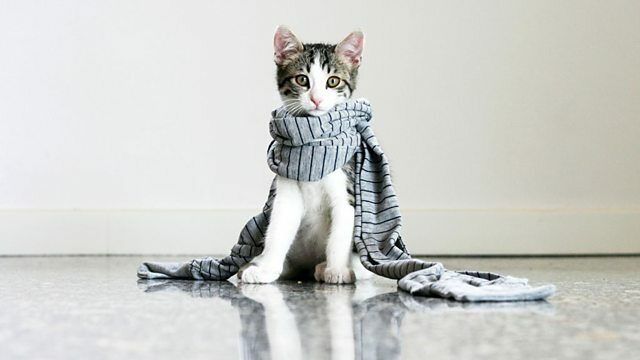 Creating woolen items for cats is one of the more quirky things you could be doing as a volunteer. You can find out more about knitting clubs for cats, biscuit poetry and magic beans in this article I wrote for Radio 1’s 1 Million Hours campaign. It’s Monday February 29 2016 – and I have been trying to remember what I was doing last leap year. Unsurprisingly, I couldn’t remember 4 years ago but I did uncover something I did in November 2001. Not just child’s play was an article I wrote for the Working Lunch website off the back of an item I produced on investing in children’s toys. 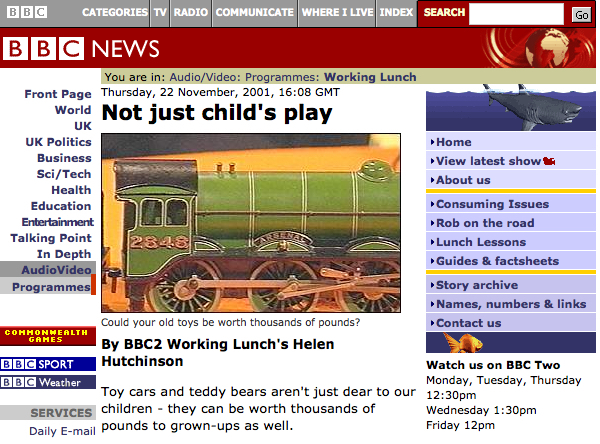 It’s fascinating seeing how the BBC websites have developed since. Selecting the BBC News Front Page link catapulted me straight back to 29 February 2016. February 2016 was a month packed with music. Savages, John Grant and Laura Marling were just some of my personal highlights from the 6 Music Festival in Bristol. I spent a great weekend working with the web team back in London. I was photo-editing, deciding which images should be used where on the website – including the single track image, 30 minute set image and the main promotional hero image. I also curated article pages, selecting the best photos which I then used to produce the Highlights article page in Isite2 -for example, Sunday Night’s Best Photos. The Monday after the 6 Music Festival, I was in the Pop Hub (which covers Radio 1, 1Xtra, 2, 6 Music and the Asian Network). I wrote my first article for Radio 1 – One Love at Radio 1 – which included dating advice from A-List celebrities Rebel Wilson, Dakota Johnson and Ryan Reynolds. On Friday, Ant and Dec were on the Radio 1 Breakfast Show. I listened to the broadcast then selected the most shareable clip. As The BRITS are next Wednesday, I chose Ant and Dec’s memories of The BRITS 2015 – which included missing Madonna falling off the stage. I put Ant and Dec’s clip in the Radio 1 Guests Collection and got it featured on the BBC Homepage on Sunday 21 February. Harold Pinter’s darkly savage drama The Homecoming first hit the London stage in 1965. 50 years on, this unsettling, savagely funny play still has the power to shock and unnerve. Director Jamie Lloyd’s adaptations of Pinter have been the best I’ve seen – his frenetic directing giving a surreal fast-cut feel to the action while always ensuring Pinter’s words remain the icy heart of the play. The play opens in total blackness. Suddenly, the stage flares into life with pounding music. Aggressive neon lights outline the edge of the house. A single light bulb dangles from the ceiling. The door bursts open and in strides Lenny (John Simm), the wiry, fast moving middle son of the family. He sits down, shakes open his newspaper and lights a cigarette. The impression is of a 1980s video but the year is 1965 and the place is South London. The door opens again and in strides macho Max (Ron Cook), the bullying father. He purposefully sits in his chair – the one that nobody else must touch – shakes open his newspaper and lights a cigarette. Father and son begin to talk in short, aggressive bursts. This warring family of four men live out their days verbally and physically sparring with each other. Max spits out venom at his camp brother Sam (Keith Allen) but Sam uses his knowledge of Max’s wife to wound back in turn. Max turns red and spits, losing control – he is a bully whose power to hurt is on the wane. Into this fractured, angry household arrive Gus (Martin Kemp), the eldest son and his wife, Ruth (Gemma Chan). The cast each inhabit their roles with precise perfection. Flashes of the inner turmoil suffered by each of the characters appear when they think they are alone. Ruth staggers around outside the house, unable to breathe. Lenny tries to smash a clock. Joe repeatedly lashes out at his own reflection in a mirror. As always with Pinter, the truth lies shimmering somewhere under the surface of the words. It’s left to the audience to insert their own back-stories into the heavy pauses and elliptical exchanges. Max certainly physically abused his sons when they were weaker than him and there are possible hints of past sexual abuse. Now it’s only his brother Sam and Joe the youngest son, the slow-witted boxer, who are on the receiving end of his walking stick. In the end, it’s Ruth’s homecoming. It becomes gradually apparent that she does not share her husband’s love of US campus life – she feels trapped over there in her role as dutiful wife and stay-at-home mother. So, she swops one family of males for another, choosing to stay with her husband’s family in London. Pinter makes no judgement on this decision – he only makes it clear that this choice is Ruth’s alone. The play closes on a final, haunting image of Ruth. She has physically unseated Max – now she is the one sitting in the chair, surrounded by her new family, staring out impassively into the audience. The balance of power is shifting and it’s left to the audience to decide who emerges victorious. This month’s Sound Women Podcast covers everything to do with mentoring – from finding a suitable mentor through to getting the most out of being a mentee. If mentoring is going to play a part in your life this year, head over to the Sound Women website and listen to the podcast. Henry VIII and his Great Progress passed by Radio 4 in October 2015. Colin MacDonald’s adaptation of C.J.Sansom’s Sovereign is bloody, gripping and full of intrigue. It’s a safe place from which to experience the terror of life in Henry VIII’s court where friends are hard to distinguish from enemies and careless talk can cost you your tongue and maybe your head too. Instead of Henry as the central character, overshadowing all around him, this story follows lawyer detective Matthew Shardlake as he takes a dangerous conspirator from York back to London for questioning. Drama director Kirsteen Cameron put me in contact with Colin so we could produce an article which could be shared across social platforms and encourage catch up listening. I created shareable assets for Twitter and Facebook which linked back to the article. Tudors tend to do very well on Radio 4’s social accounts. Matthew Shardlake and his experiences of the paranoid Progress were no exception.